From left: Kate Fox, Olivia Cheng, Devin Fortune, Ethan Stephens-Puls, Brooke McKinlay, Joshua Steging. Sophomore Joshua Steging has excelled for the boys soccer team, which is 5-5-3 overall. "Last year, Joshua showed skills to be ready for varsity and we are excited to have him on the varsity squad this year," said coach Robert Bokma. "Joshua has shown amazing maturity on and off the field that has helped other players around him become better people. Even though he is one of the younger players on varsity, his confidence and drive to succeed are making our team stronger." Ethan Stephens-Puls was also honored from the boys soccer team. "Ethan has started this season making our offense a very dangerous group," Bokma said. "Whether he is scoring the goals or disrupting the defense so others can score, he has helped us score the most goals to start the season in school history. Our 6-2 win over Elsinore was the most goals we have scored in a game in school history. He has come into this season with a great attitude and has made sure he puts the team first, which is helping us be successful." Brooke McKinlay is this week's honoree from the girls soccer team. "This year, Brooke has shown an intense desire to help the varsity team to play to their ability," said her coach, Mark Vogel. "Her commitment to being prepared and willingness to improve is a very good role model for the younger players this year. While trying to balance a very busy senior year, Brooke continues to impress as an athlete, and is constantly motivating her team as an emotional leader." Kate Fox is a key player for the girls water polo team, which is 17-6 overall and 2-1 in league play. "Kate led our team offensively in our tournament last weekend," said coach Audra Woods about her play in the Five Counties Tournament. "She is also a dominant player defensively as well." Senior point guard Olivia Cheng had a great first week of league play for the girls basketball team, which is 14-5 overall and 2-1 in league. "Olivia led our team on and off the court," said coach Kyle Rouse. "She also carries a 4.86 GPA and is one of our hardest workers." Sophomore forward Devin Fortune is averaging 6.8 points per game for the boys basketball team. 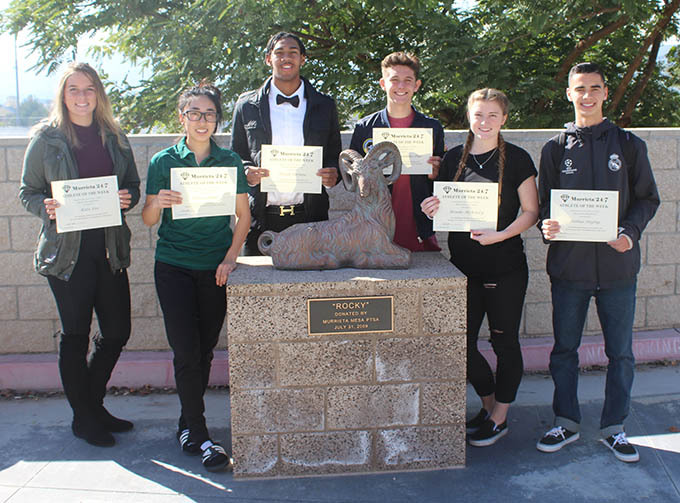 These students are eligible for the Athlete of the Month award. Anyone wishing to purchase a print copy of this article may do so by emailing murrieta247info@gmail.com.